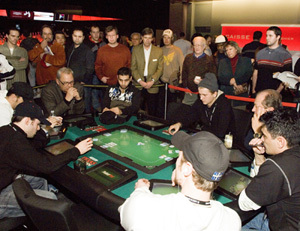 « Tony G to Pass on WSOP ’11, Too? PokerTek, Inc. the industry leader in automated poker technology, is pleased to announce that Gaming Laboratories International (GLI) has approved its latest PokerPro software, Tournaments Plus+, version 3.0. This approval clears the way for installations and upgrades of this new software into jurisdictions worldwide that accept GLI certification. Since receiving approval, the new software has already debuted at Harrah’s Cherokee Casino, and was instrumental in running the site’s first World Series of Poker tournament on twenty PokerPro tables in early May. The field began with 269 players and ended with the first place winner taking home over $25,000 in prizes, including a $10,000 WSOP buy-in. Upgrades will continue at other PokerPro customer sites in the coming weeks. A complete Multi-Table Tournament (MTT) solution, with tournament buy-ins, rebuys, and add-ons all collected and managed through the PokerPro system. Updated management tools that allow the operators to schedule MTT’s, register players, and collect buy-ins in advance. New management tools allow for large MTT’s to be run efficiently with minimal dedicated staff. Allows any combination of Alternates, Rebuys, and Add-Ons across multiple tables. Dynamic tiered payout structures, with prizes paid directly to player accounts. A new community Tournament Leader Board displays player rankings and chip stacks, an active tournament clock, blind levels, and tournament statistics. New player screens display up to the minute tournament statistics, personal hand statistics, and a complete leader board. MTT specific reports give complete visibility into all tournament and player activity. PokerTek, Inc. (NASDAQ:PTEK) is a licensed gaming company headquartered in Matthews, NC that develops and distributes electronic table game solutions for the gaming industry. The company’s products are installed worldwide, and include PokerPro and Blackjack Pro. For more information, visit: www.PokerTek.com. In a future update, you should allow remaining players at a final table to pause the tournament clock for a set amount of time in order to make a “deal” within the software. I see deal making quite a bit in cherokee, however, the prize money is deposited into player accounts as normal, then everyone has to divide the money as they agreed after cash out (This assumes everyone will honor their word). It would be nice if the computer could control the deal making procedures and deposit money into each player’s account according to the terms of the deal automatically.